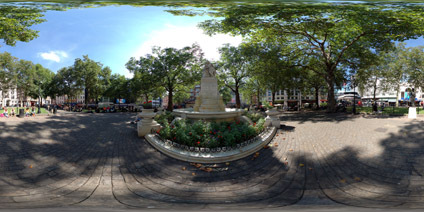 he garden in Leicester Square was purchased and landscaped by Albert Grant a Member of Parliament in the 19th century. It was conveyed by him to the Metropolitan Board of Works on the 2nd July 1874 to be preserved for ever for the free use and enjoyment of the public. At the heart of the garden is a statue of William Shakespeare placed as the centre piece of a fountain which transcribes the history of the area. Opposite William Shakespeare is a statue of Charlie Chaplin, in line with the Empire Cinema, located on the north side of the square.